Good morning, tiny people! I had the recent honor of watching an advanced screener of a new tiny house film: Small is Beautiful: A Tiny House Documentary. We tiny house lovers have a tendency to romanticize tiny house living, but you won’t find that in this film. Small is Beautiful takes us on a realistic journey into both the pros and cons of building and living tiny. Starting on the tiny journey is not just about the physical house, but also about the inner struggle with living with less and in less space. This film does a great job of showing these external and internal struggles. Beyond the turmoil is the freedom, peace, and simplicity gained by going tiny! You also get to meet people either building or already living tiny and learn about their experiences. I recommend that any tiny house newbie add this to their list of necessary resources. 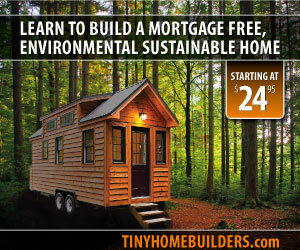 Not a tiny house newbie? It’s still well worth your time to watch. You can watch the trailer for Small is Beautiful here, or preorder the film here. In case you’re wondering, this film has some similarities to the other film I saw, (TINY: A Story about Living Small) but is different enough that I highly recommend that you watch both. Can’t wait to see this! Thanks so much!